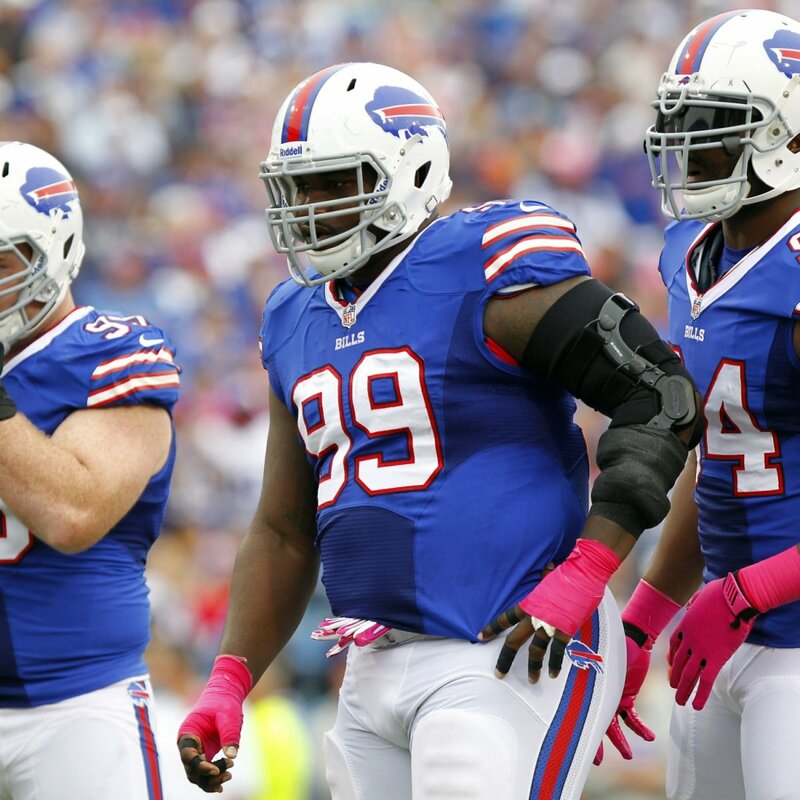 They built their reputation as a power running offense with excellent, hard hitting defense. 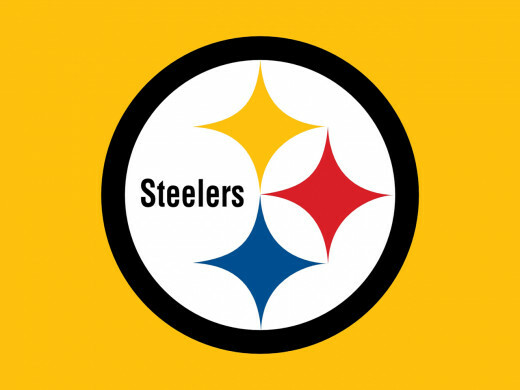 Today, I rank the top 10 Pittsburgh Steelers of all time. He is one of the most physical cornerbacks ever to play the game. 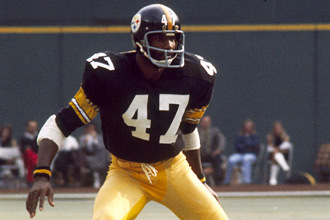 A third round pick in 1970, Mel Blount was the prototype cornerback of his era. He had the size, speed, and quickness for the position, plus the toughness and mental ability to adjust his coverage tactics and excel despite rule changes that favored receivers in 1978. Blount was equally effective playing either zone or man-to-man defense. Known for his rugged style of play, his specialty was the bump-and-run pass defense. With his combination of his size and speed, he physically overpowered wide receivers. Blount ended his 14 year career with 57 interceptions. He was a five time pro bowler, six time All-Pro, the 1975 NFL defensive player of the year, and a four time Super Bowl champion. He was inducted into the Hall of Fame in 1989. He is one of the most underrated receivers in league history. 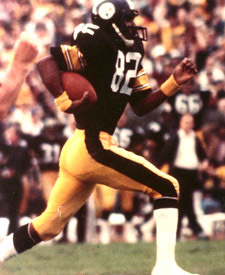 A fourth round pick in 1974, John Stallworth was the Steelers starting wide receiver for 13 out of his 14 seasons with the team. In Super Bowl XIII, he caught a record-tying 75-yard touchdown pass and finished the game with three receptions for 115 yards and two touchdowns. Stallworth holds the Super Bowl records for career average per catch and single-game average. He has 12 touchdown receptions and recorded 17 straight games with a reception in the postseason. Stallworth also scored touchdowns in an NFL record eight straight playoff games. 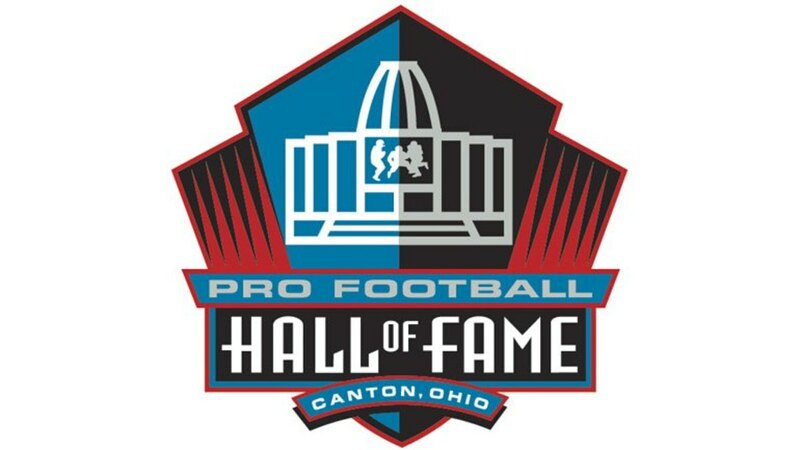 Stallworth retired after the 1987 season as an All-Pro, three time pro bowler, the 1984 comeback player of the year, and four time Super Bowl champion. He was inducted into the Hall of Fame in 2002. He is arguably the best blocking wide receiver in league history. A third round pick in 1998, Hines Ward impressed coaches with his versatility, hands and willingness to block. In 14 seasons with the team, he broke every important receiving record in team history. Ward was named MVP in Super Bowl XL recording five receptions for 123 yards, one touchdown and one rush for 18 yards. He often faced criticism for his style of blocking, particularly for his propensity to hit defenders on their blind-side. Ward retired recording 1,000 receptions for over 12,000 receiving yards and 85 touchdowns. Ward was a four time pro bowler, three time All-Pro, three time team MVP, Pittsburgh's all time leading receiver, and a two time Super Bowl champion. "Dobre Shunka" was one of the greatest outside linebackers in league history. A second round pick in 1971, Jack Ham won the starting strong side linebacker spot as a rookie. His quickness made him an impact rushing the passer and covering receivers. Although he was a ferocious hitter, Ham was known as a player who couldn't be fooled and was seldom caught out of position. He was one of the few outside linebackers who could play pass defense as well as the NFL's top safeties and corners. In his 12 year career, Ham had 25 sacks, 21 fumbles recovered, and 32 interceptions. His 53 takeaways are the most in NFL history by a linebacker. Ham was an eight time pro bowler and All-Pro, a member of the 70's all decade team, and a four time Super Bowl champion. He was inducted into the Hall of Fame in 1988. He is one of the greatest run blocking centers of all time. 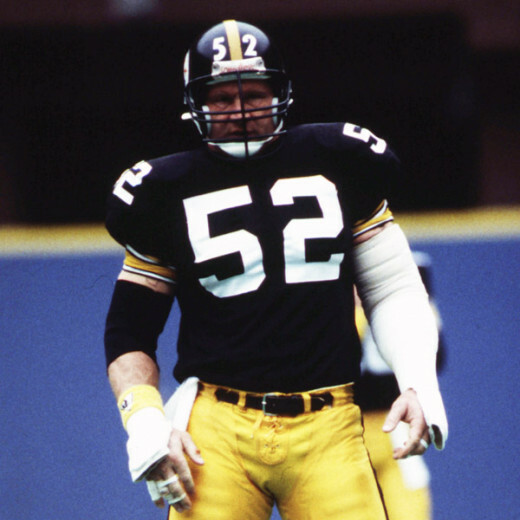 A fifth round pick in 1974, Mike Webster quickly became the anchor for the great teams of the 70's. From 1976 to 1986, he started 150 straight games. An avid weightlifter, Webster was known for playing with bare arms to keep opponents from grabbing his sleeves. 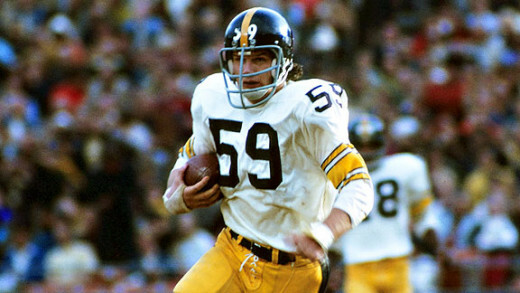 At the time of his retirement, he was the last active player in the NFL to have played on all four Super Bowl winning teams of the 70s Steelers. He played more seasons as a Steeler than anyone in franchise history with 15. Webster spent his final two seasons with Kansas City. In 17 seasons, he retired as a nine time pro bowler and All-Pro, a member of the 70s and 80s all decade teams, and four time Super Bowl champion. He was inducted into the Hall of Fame in 1997. He could have retired as the leagues all time leading rusher. 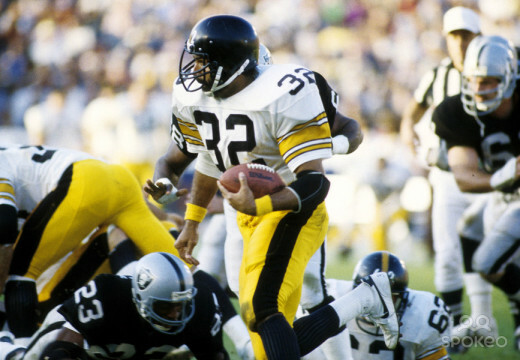 A first round pick in 1972, Franco Harris was an instant impact on the offensive winning the rookie of the year award. In the 1972 divisional playoff game, he made one of the most famous and controversial plays in NFL history catching a deflected pass and scoring the game winning touchdown in what has become known as the "Immaculate Reception." In Super Bowl IX, Harris was named the game's MVP as he rushed for 158 yards and a touchdown. He was criticized for tendency to run out of bounds instead of taking on tacklers for extra yards. In his 13 seasons, Harris gained 12,120 yards on 2,949 carries, and scored 91 rushing touchdowns. Harris spent his final season in Seattle before retiring in 1984. He was a nine time pro bowler, two time All-Pro, and four tome Super Bowl champion. He was inducted into the Hall of Fame in 1990. He is one of the greatest playmaking defensive backs in league history. A first round pick in 1987, Rod Woodson made an impact as a cornerback and punt returner. 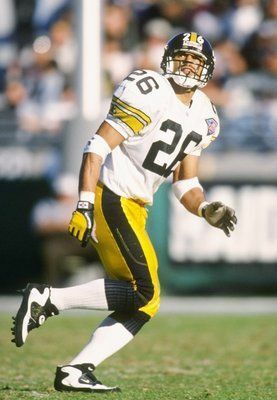 He excelled on defense and special teams recording 38 interceptions and nine total return touchdowns in his 10 seasons in Pittsburgh. In 1993, Woodson was named the leagues defensive player of the year. In 1995, he became the first player to return from reconstructive knee surgery in the same season. He is the youngest man to be named to the NFL's 75th anniversary team. Woodson and the Rooney family failed to agree on a new contract, so he decided to try out free agency. Woodson spent his final seasons in San Francisco, Baltimore, and Oakland. In his 16 seasons playing cornerback and safety, he was an 11 time pro bowler, seven time All-Pro, Super Bowl champion, and holds the NFL record for most career interception returns for touchdowns. He was inducted into the Hall of Fame in 2009. He was the premier middle linebacker of his era. 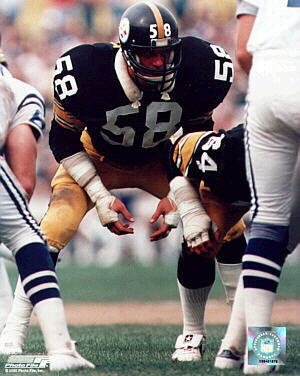 A second round pick in 1974, Jack Lambert was said to be too small to play linebacker in the NFL. Lambert was the prototypical middle linebacker for what became the Tampa Two defense. In his first season, he was named the defensive rookie of the year. He prided himself on his ability to hit hard and intimidate the opposition and averaged 146 tackles a season. Lambert amassed 28 career interceptions, 1,479 career tackles, and 23.5 sacks in his 11 seasons. In 1976, he was named the NFL defensive player of the year after he led the defense only allowing two touchdowns and forcing five shutouts in the teams final nine games to help the team finish 10-4. Lambert retired after 1984 as a nine time pro bowler, eight time All-Pro, and four time Super Bowl champion. He was inducted into the Hall of Fame in 1990. The "Blonde Bomber" helped turn the team from 30 year losers, to playoff contenders. The first overall pick in 1970, Terry Bradshaw was a though competitor in his time. While possessing a strong arm, he was known for being very erratic with his passing. In 1978, Bradshaw was named the NFL MVP after leading the league in touchdowns passes with 28. In Super Bowl XIII and XIV, he was named the games MVP. He is manly criticized for his even touchdown to interception ratio and his low intelligence. 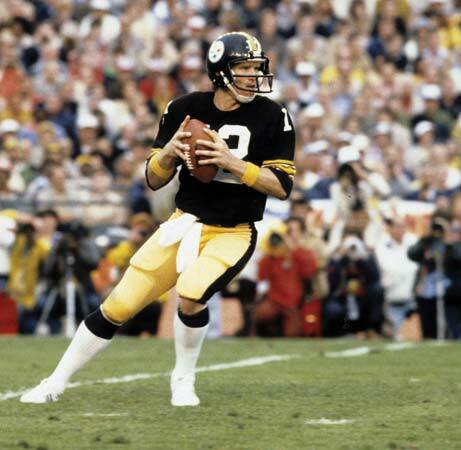 Nevertheless, Bradshaw was able to lead Pittsburgh to four Super Bowl victories in the 70's. Injuries forced Bradshaw to retire after the 1983 season. He was an All-Pro, three time pro bowler, two time Super Bowl MVP, the 1978 NFL MVP, led the league in touchdown passes twice, and was a four time Super Bowl champion. He was inducted into the Hall of Fame in 1989. "Mean Joe" was he first player who changed the losing culture in Pittsburgh. 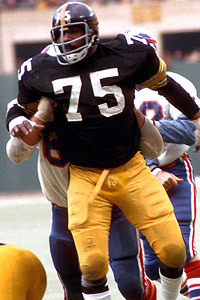 A first round pick in 1969, Joe Greene quickly became one of the most dominant defensive players in the NFL winning the defensive rookie of the year award. Throughout his entire career, he was double teamed or triple teamed on every play. Greene was the leader and the anchor of the "Steel Curtain" defense and his temper, quickness, strength, and intensity became what the defense was known for. His size and reputation allowed other members of the defensive line to make plays on the offense. 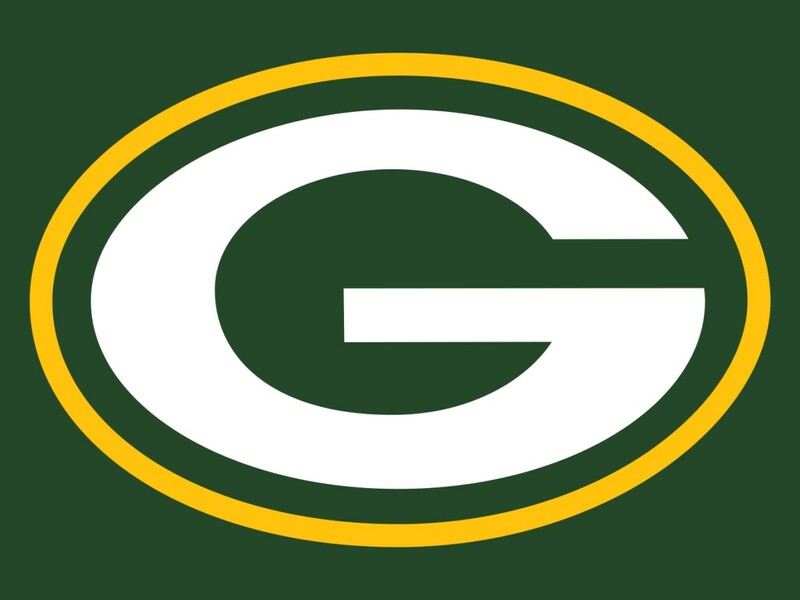 It can be argued that Greene is responsible for freeing up the defense so that eight of the 11 starters could become pro bowlers. In 13 seasons in Pittsburgh, he recorded 78.5 sacks, 16 fumble recoveries, and an interception. Greene retired after 1981 as a 10 time pro bowler, eight time All-Pro, two time defensive player of the year, and four time Super Bowl champion. He was inducted into the Hall of Fame in 1987.
Who is the greatest Pittsburgh Steelers?